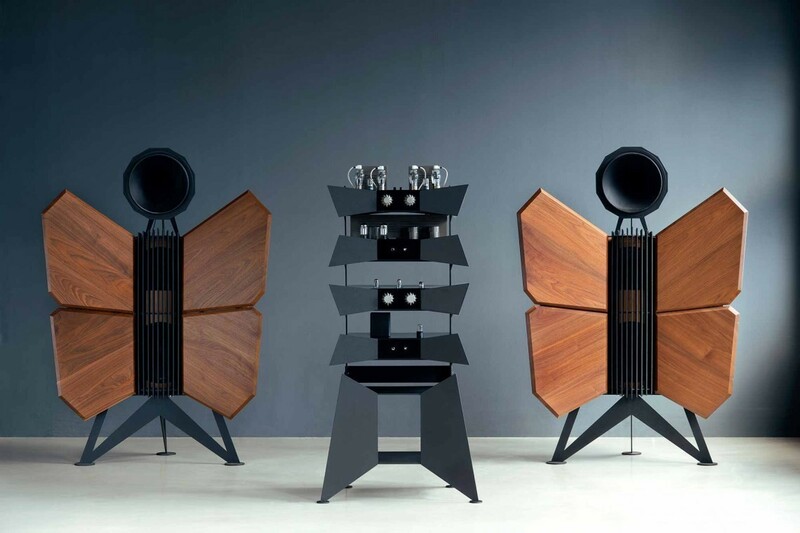 Speakers come in all shapes and sizes as demonstrated by these Oswalds Mill Audio Monarch speakers. The motor in a loudspeaker drive unit is a critical element in obtaining high performance. The moving coil principle is a century old and it has survived this long because it has certain advantages which no other technology has yet improved upon. For low frequency reproduction where significant travel is required, there is little competition. The job of the speaker motor is to generate a force proportional to the current flowing in it. The moving mass then translates that force into the correct acceleration of the diaphragm. There would seem to be little that could go wrong with that, but a slightly more detailed look will reveal potential problems. In a woofer motor, the coil must overhang the magnetic field so that sufficient travel is available. For a fixed current the force ought to be absolutely independent of the coil position. Simplistically, only the part of the coil within the magnetic field is contributing to the force. In practice the situation is a little more complicated because the magnetic field does not stop abruptly at the end of the gap. There is always a fringing field spreading beyond the gap, so the active length of the coil is a little longer. That in itself isn’t a problem, but a problem will arise if the fringing field is not symmetrical. A symmetrical field distribution is perfectly possible, but magnetic circuit design is often compromised by economic factors. Figure 1 compares pole designs. Figure 1. At (a) the flux pattern fringing the gap is asymmetrical, whereas a small change in the magnetic circuit (b) fixes the problem. The coil dissipates heat in normal operation. In fact moving coil drive units are so inefficient that most of the amplifier power is converted to coil heat. The difficulty is that the resistance of the coil changes with temperature. The amplifier does not know that has happened. The problem can be divided into long term and short term. The long term problem causes the amplifier to see a higher resistance, so the sound level goes down. This is referred to as thermal compression, or power compression. The short-term problem occurs at low frequencies where the temperature of the coil changes throughout the cycle. This causes harmonic distortion. There are two ways of dealing with thermal issues in the coil. One is to enhance the ability of the coil to cool itself, the other is to make the drive unit more efficient, so less heat is developed for the same sound level. The laws of physics sometimes have to take a back seat to the irrational, because loudspeaker drivers are often sold by their power rating, where more is obviously better to an uneducated buyer. Improving the efficiency of a drive unit will reduce the amount of power needed for the same amount of sound, so the power rating goes down. To the designer of an active speaker, a more efficient driver has the additional advantage of needing a smaller amplifier and a smaller power supply, so a small additional expense incurred to make the driver more efficient may be more than compensated elsewhere. Genelec Master Series loudspeaker system. If a coil is wound from round wire which doesn’t fit together very well, the packing density is Π/4 or about three quarters. Square wire is intended to improve the packing density. But does it improve the efficiency? If the cross sectional area of the wire remains the same, the resistance and the mass will be unchanged. The coil would have 88 percent of its original length, so the BL product would go up by about 13 percent, with a penalty of a small reduction in coil travel. The argument for square copper wire is not very strong as the efficiency is impaired more by the high relative density than by the poor packing. (BL, expressed in Tesla meters, this is a measurement of the motor strength of a speaker. In a woofer with an overhung coil, the part of the coil not in the gap is worse than a dead weight because it is also dissipating heat. In applications such as house wiring, copper wire is chosen because copper has the best conductivity. In moving applications, copper may not be the best choice, because it has a relative density of 8.9, which is rather high. As the efficiency of the drive unit is affected by the moving mass, then the ideal material for a coil is one which has a good ratio of conductivity to density. In that respect aluminium is superior to copper, hence its use in airplanes. The conductivity of aluminium is only 63% that of copper, but the relative density of 2.7 is only 30% of the density of copper. This makes the ratio of conductivity to density about twice as good. In practice pure aluminium tends to oxidise and it is difficult to make connections. The solution is to use a thin layer of copper. CCA (copper clad aluminium) is popular for moving coils. Worker assembling voice coil and cone onto speaker frame. 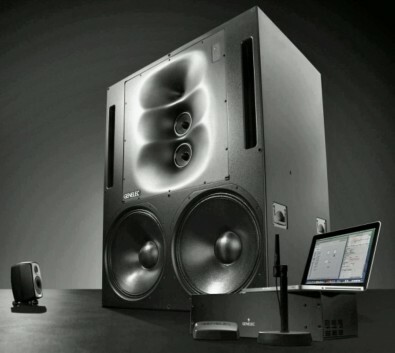 Image: Volt Loudspeakers. An aluminium wire needs a cross section 57 percent greater to have the same resistance as a copper wire. This means that the volume of the magnetic gap has to increase and the volume of the magnet has to increase in proportion. Adopting square wire allows an improvement of 27% in cross section, about half of what is needed. The use of a square section is practically essential if aluminium is to be used. Another advantage of square wire is that it can be made self-supporting by gluing the turns to one another, eliminating the coil former and enhancing the cooling. Much of loudspeaker motor design is sub-optimal for historical reasons. Early drive units had no permanent magnets at all. Instead a steady current passing through a winding created the field in which the moving coil operated. In the days of Class-A audio amplifiers, the constant amplifier supply current was simply passed through the field winding. The first magnetic material that was really suitable for moving coil loudspeakers was a material named Alnico, which may have something to do with the aluminium, nickel and cobalt from which it was made. Alnico had the characteristic that Magnetomotive Force (MMF) per unit length was not very high, whereas the flux density was high. The result was that magnets with enough MMF to drive a speaker coil gap needed to be quite long but relatively thin. The slim rod magnet is great for a tweeter, where we want a small diameter coil and diaphragm, but not so good for a woofer, where the small coil causes a stress concentration at the neck of the cone. 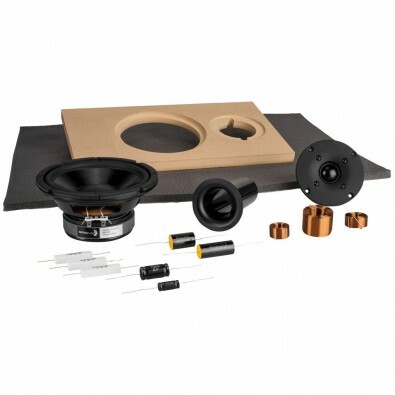 While loudspeaker systems can be DIY, the individual component speakers are not. Image: Parts Express. The small diameter coil causes a further problem, which is that to obtain high enough impedance, the coil may have to be double wound. Double winding is extremely common, but it has the effect of halving the surface area available to shed heat. Whilst Alnico was a good material, it contained cobalt which was a cold war strategic material whose cost rocketed. The economic alternative was ferrite, which had precisely the opposite characteristics to Alnico, having good MMF per unit length, but poor flux density. Instead of being long and thin, ferrite magnets had to be short and fat. Despite the fundamental difference, loudspeaker designs were changed as little as possible to accommodate the new material and the compromises came thick and fast. One fundamental way in which magnetic circuits differ from electric circuits is that in electricity we can prevent the current going where we don’t want by using an insulator. In magnetism the only equivalent of an insulator, a material that will not allow flux to penetrate, is a superconductor, which is presently not practical for speaker motors, so for all practical purposes there are no magnetic insulators. This means that magnetic flux can be lost by leakage, where the flux decides to take a short cut through the air, bypassing the place we would prefer it to go. With ferrite magnets, it was no longer possible to accommodate the magnet inside an existing coil, so it was formed into a ring and placed outside. Now the magnetic circuit is not following the natural path of the flux, but fighting it. 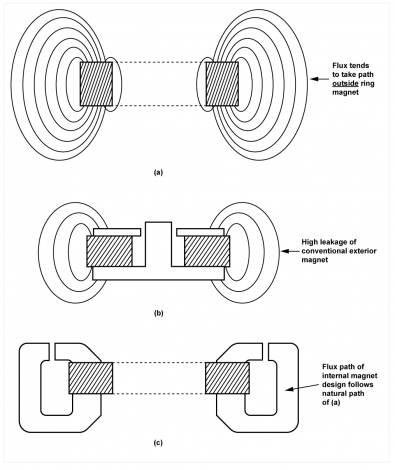 Figure 2 shows that as there are no magnetic insulators, much of the energy of the magnet is lost to leakage. That leakage flux represented a waste of money. So now from the standpoint of a woofer, we have the worst of all worlds. An inefficient magnet suffering leakage, feeding flux to an unnecessarily small coil that causes a stress concentration in the diaphragm and has difficulty cooling itself. Figure 2. Magnetic lines mutually repel, so the flux from a ring magnet tends to go outside the ring as shown at (a). Trying to put the coil inside the magnet results in leakage at (b). Using a larger coil (c), the magnet can go inside it and leakage is practically nil. A better solution to the problem of woofer design is to employ a larger diameter coil which has a number of advantages. The stress between the coil and the cone is reduced, and the bending loads in the diaphragm are reduced because the perimeter is closer to the coil. For the same stiffness, the diaphragm can be lighter. A tremendous advantage of a large coil is the improvement in cooling ability, especially if it is large enough to be single wound. The magnet can be inside the coil, reducing leakage. For the same field in the gap, modern magnets are vanishingly small compared to ferrite magnets. Neodymium magnets were developed in 1982 by General Motors and Sumitomo Special Metals and the strongest type of permanent magnet commercially available. One issue today with these magnets is that the popularity of electric cars drives up the price of neodymium. Coil cooling may be enhanced using ferrofluid, which is held in the space between the poles and the coil because it has magnetic properties. Another approach to improved cooling is where the coil is divided into two tandem single wound coils, wound in opposite directions on a common former. There are two magnetic gaps, effectively in series, but the volume of each is smaller than would be needed for a double wound coil. The result is that the surface area of the coil is doubled. In practice the intelligent use of modern materials to improve efficiency and designs that improve cooling mean that power compression should be a thing of the past. Power compression represents amplifier output watts that are not turned into sound and instead get transformed into heat. Watkinson has now written 16 chapters in his on-going treatise about loudspeakers. A link to Part 1 in this series can be found below. All parts in Watkinson’s loudspeaker series can be found by searching for “Watkinson” from The Broadcast Bridge homepage. 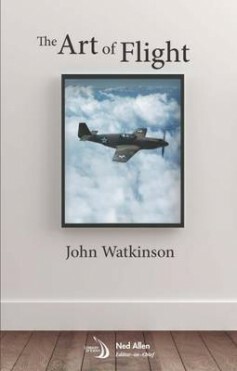 John Watkinson has a recent book that readers may wish to view. In The Art of Flight, John Watkinson chronicles the disciplines and major technologies that allow heavier-than-air machines to take flight. The book is available from Waterstones Book Store. 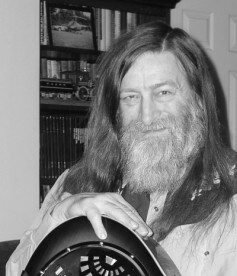 John Watkinson Consultant, publisher, London (UK).